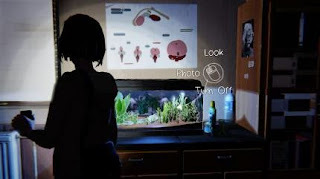 Life is Strange is an adventure video game, with a clear focus on the cinematically staged story. 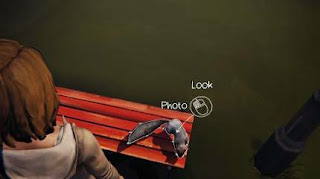 Nevertheless, the game in the various areas provides many hotspots away from the actual action, where you can look at interesting objects and talk with other characters. Also during the third episode of Life is Strange you can take pictures ten optional photos. While some of them are relatively obvious to find, others require a little more brain power. The subscribe notes in the album of Max. In this article, we list all the optional photos, their locations and actions required. At the beginning of the episode you are at night in the dormitory of Max. Here you can talk with Taylor and with Dana in the laundry room. From both you learn that Victoria has sneaked out of the house. With this information you now have the opportunity to enter the room of Victoria. On the back wall next to the desk an action figure stands on a chest of drawers, next to a radio. This you have to illuminate for a few seconds with the light of your cell phones, then you can make it a photo. After leaving the residence hall you are again in the court, but in the time it's pretty empty. On the right side of the square, the second photo is waiting for you. At this point, a photograph could be made of a squirrel in the two previous chapters each. This time you can see again so a little rodents on the bench, playing with the fireflies. Once you approach the little man runs away. So imagine now directly to the bank and rewind with Max back in time as far as possible. 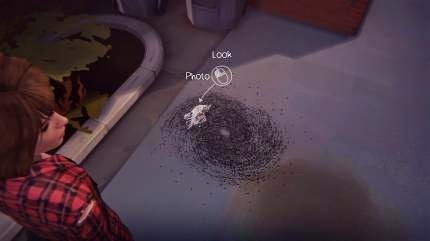 Now you have to do is to respond quickly and select the photo option on squirrels. Some time later you are with Chloe in the dark corridors of Blackwell Academy. 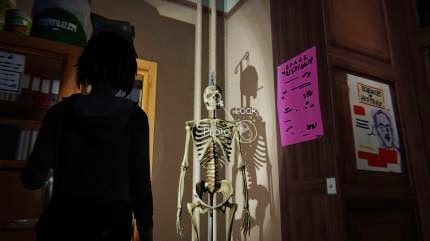 While Max's girlfriend tries to break into the principal's office, you can explore freely with the Max-known spaces of the school. Particular attention her case direct to the science classroom. On the window wall there is an aquarium. This you have to consider first, then turn on the light, and finally you can do the photo. In the same room there is also the next photo opportunity. 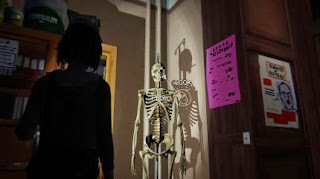 At the far end of the classroom stands in the corner at the second door a skeleton with a cigarette. Max can make a comment that my colleague should switch to e-cigarettes at least. However, we are interested in the photo for the album that you added to the corresponding option of your collection. For the next photo you must first go to the principal's office. Since Chloe no longer comes with her castle Knack skills, Max makes the ingredients for a small pipe bomb to collect. Once you have all together, go up, the alarm triggers the bomb. Now quickly turn back to the office and the time. The bomb never explodes and you can Chloe from the inside to open the door. 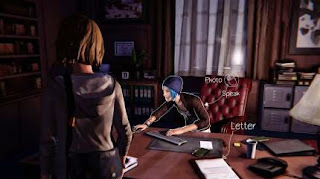 After this take place in the director's chair, do you imagine the desk and makes Chloe a photo. The next morning, Max wakes up at Chloe and dresses newly out of the closet of her friend a. This type change must of course be captured on film. For this you leave the room and Chloe goes to the bathroom, which is equal to the right hand side across the hall. Here is located on the left side a large mirror. 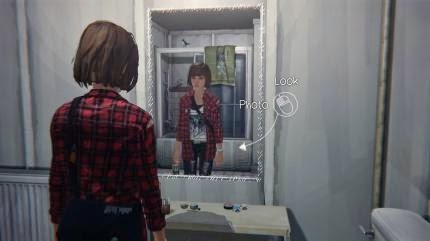 In it, Max can look in her new outfit and snap a photo of herself. For the next photo you move into the lower floor of the house. Here you can see not only Joyce standing in the kitchen. If you look around carefully, you should notice a bird sitting on a cabinet in the living room. First, you will open the window next to the fridge. Now you go to the bird and scare, so that it flies away. Next, he sits on the fireplace, where repeats the process. Now the bird flies through the open window into the garden. You can now also go through the patio door to the outside. 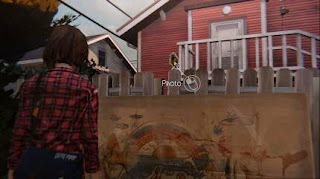 The bird sits on the rear end on the fence about the old image that Max and Chloe have painted as children. This is your photo. 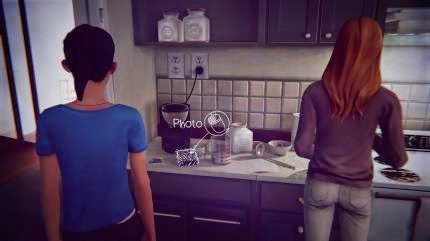 It continues for Max and Chloe at the Two Whales Diner. However, before you enter the restaurant, you go past the entrance. Opposite the entrance you see a truck without a trailer with American flag. Here a photo option is already displayed, but you allowed the Trucker not to take a picture of his vhicle. So talk to the man and ask him if he has a bad day. 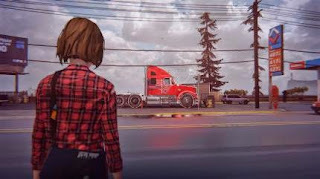 Then he comes to Rachel Amber talking and reveals details about his truck. Now is the time and speak the trucker once again and this time use the new information. Now he allows you to make a photo of the truck. The next photo is just step from the previous subject is backing away. Follow the road and bend behind the diner in the alley one in which you are already met in Episode 2 on the homeless. Once you come around the corner, you should on the left side of the alley, in front of two garbage can, see a dead bird, which is encircled by an army of ants. That's the perfect motive for Max to record the mysterious events in Arcadia Bay. The last photo of the third episode is the same with the thickest spoiler. You should therefore have the game already played when you read these lines. 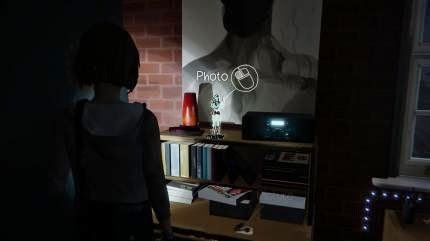 In nerve-wracking finale Max travels back five years in time and can be found in Chloe's house. Here make William, Chloe's father, a picture of Max and her friend. After that you can move freely, the young Max. Now go to the camera lying on the kitchen counter left Chloe and use them. Congratulations, now you have collected all photos.